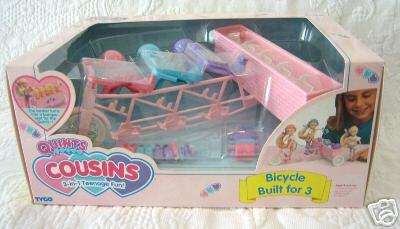 --"For a 3-in-1 bike ride! --Includes: 3 water bottles, 3 fanny packs, 3 bike helmets, 3 pairs of sneakers and bike shorts. 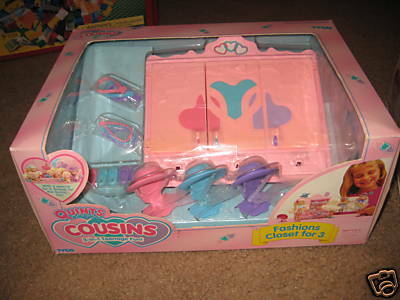 --Hairstyling fun for the cool Quints Cousins™! --Includes: wash ‘n style vanity, salon chair and footrest for 3, 3-in-1 smocks and hair styling accessories (curlers, blow dryers and mirrors). --Includes: closet with a special-for-5 drawer for the Quints, 3 hats and hat stands, 3 belts, 3 necklaces, 3 pairs of shoes, and 3-in-one hanger. 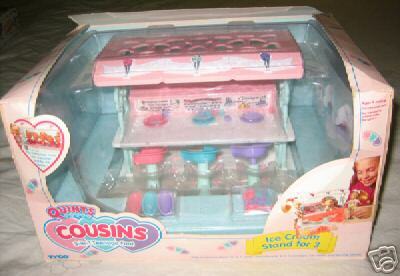 --"Delicious fun for the cool Quints Cousins™!" --Includes: ice cream stand for 3, 3 seats, menu board, 3-in-1 coverups, ice cream and serving pieces. 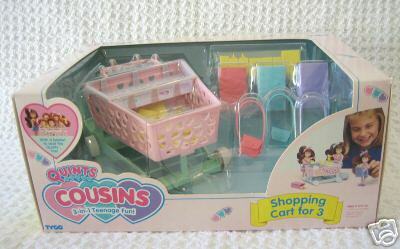 --For 3-in-1 shopping fun! --Includes: 3 shopping bags, 3 purses and lots of food. 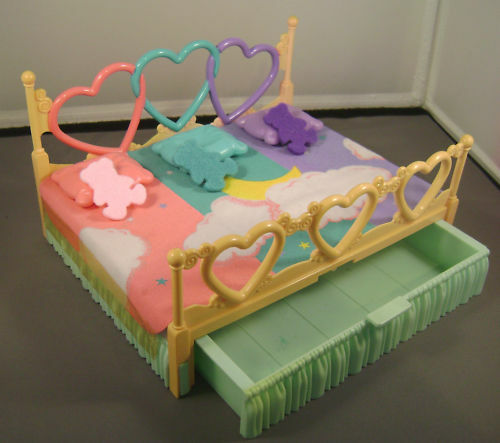 --- --I have never seen this set on eBay. Was it ever released? This site, its design, and all content within are Copyright ©2013 by Zuse unless stated otherwise. All rights reserved. 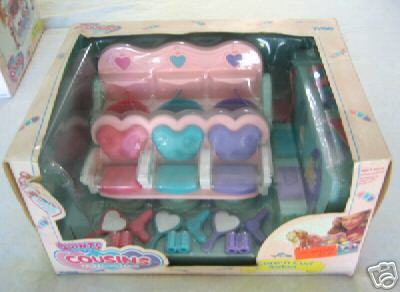 Quints name and logo are registered trademark of Tyco, Inc. The Quints Guide is intended as a reference for collectors and is in no way endorsed by or affiliated with Tyco. All names, logos, and trademarks are the property of their respective owners. Copyrights for the pictures hosted on this site are held by their respective owners.